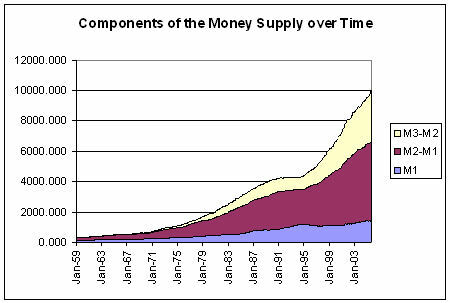 Fed money supply 101 in 5 minutes flat. M1 — Measure of the U.S. money stock that consists of currency held by the public, travelers checks, demand deposits and other checkable deposits including NOW (negotiable order of withdrawal) and ATS (automatic transfer service) account balances and share draft account balances at credit unions. M2 — Measure of the U.S. money stock that consists of M1, certain overnight repurchase agreements and certain overnight Eurodollars, savings deposits (including money market deposit accounts), time deposits in amounts of less than $100,000 and balances in money market mutual funds (other than those restricted to institutional investors). M3 — Measure of the U.S. money stock that consists of M2, time deposits of $100,000 or more at all depository institutions, term repurchase agreements in amounts of $100,000 or more, certain term Eurodollars and balances in money market mutual funds restricted to institutional investors.